Who needs Uber? Visitors tour Cuba in a classic ’57 Chevy now serving as a cab (photo: Lisa Green). What is it like inside Cuba today? Our former colleague Lisa Green just returned from a People-to-People visit to Cuba, so we asked her to share some of her experiences and photos with us, and with our clients who are interested in Cuba or planning to visit over the coming year. 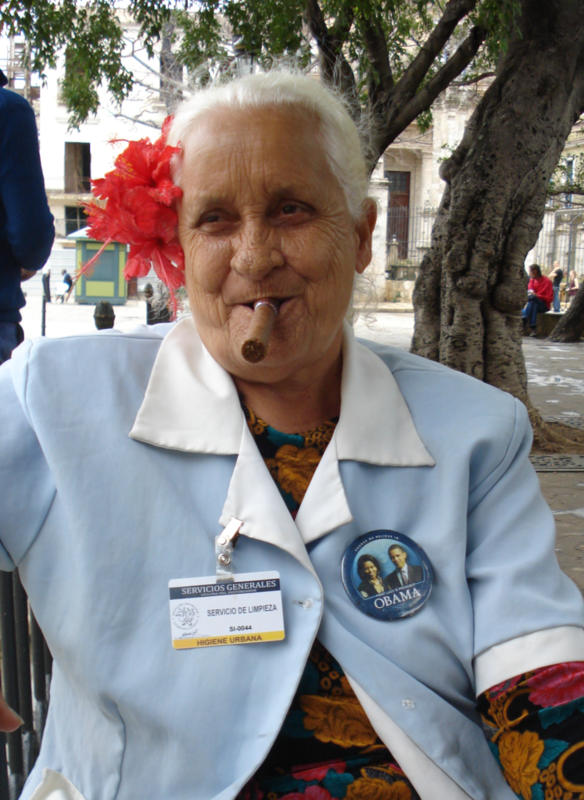 As a refresher, Americans are not permitted to visit Cuba as “tourists.” All visits must be part of a people-to-people educational exchange program, to include cultural experiences such as school visits, meetings with local artists or musicians, or in Lisa’s case, a session with a local Ph.D. and Economics Professor from the University of Havana to talk about the changing “Cuban Economic Model” and Cuba’s strategy for economic development. 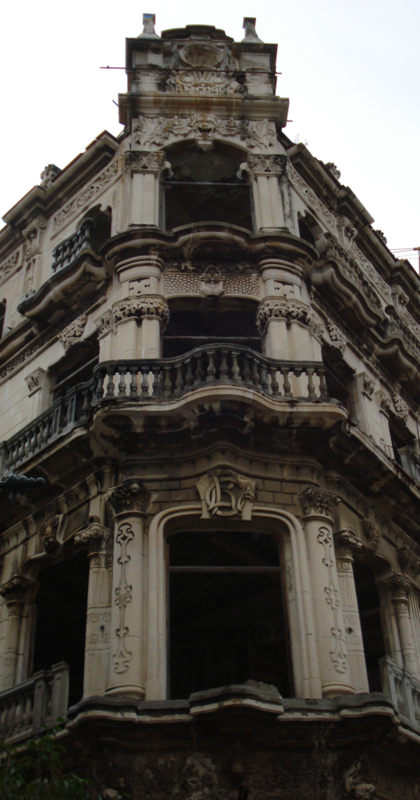 One of many government buildings in La Ciudad Vieja, or Old Havana (photo: Lisa Green). The Cuba exchange was a natural for Lisa, who is a seasoned financial professional with many years of prior work experience in Latin America as a technical advisor in the areas of microfinance, business development, human rights and socially responsible investing. One thing that did surprise her in Cuba, however, was the huge number of tourists, especially Europeans. 75-year-old Erica is a Street Sweep in the city park, earning 175 pesos a month, or about $6 (photo: Lisa Green). “Cuba is an amazing dichotomy of time capsule old meets bursting new,” says Lisa. There’s an atmosphere of eager, suppressed entrepreneurship very ready for life in a post-embargo Cuba, she notes. When in Cuba, be prepared for a “connectivity detox.” Due to the embargo, your cell phone won’t work, and internet connectivity may be sporadic, slow or altogether absent. “No cell coverage in Cuba, or at least not for what I was willing to pay,” confirmed Lisa. There’s no doubt that Cuba’s aged and failing infrastructure is stretched to the limit with the high number of visitors, says Lisa. You can’t take for granted the typical tourist services that you can find elsewhere in the Caribbean, but encounters with the passionate Cuban people, and hearing their stories and experiences, can make the trip very worthwhile, Lisa explains. To learn more: Lists of eligible people-to-people trips are available online (for one partial listing, click here). For a short introduction on travel to Cuba, see “5 Things You Need To Know About Visiting Cuba” from U.S. News & World Report Travel. ← What Do Oil Prices Tell Us About The Future Price Of Stocks? Mari, I found the story on Lisa’s trip to Cuba interesting. She put a lot of the justification for Cuba’s condition on the ’embargo’. She swallowed the propaganda! Cuba conducts business with 99% of the world, including the US. The embargo is the excuse for a failed economic model. The whole economy has been propped up by Russia and lately by Venezuela; not a sustainable model. They have an educated work force without jobs, they export doctors to 44 counties and charge $100k per year for their services; the doctor gets $5k/year. They used to call this slavery. Lisa refers to the embargo as the reason for not having Internet or wireless connectivity. The reason for no connectivity or Internet is because the Cuban government does not want their people to know what is going on in the rest of the world. The more isolated they are the more they will believe that the reason for their misery is the embargo and the more they can stay in control. I have spent time with the CEOs of Fortune 100 Companies, none of them are considering investing in infrastructure for the island. Cuba nationalized their companies once already they are not about to risk it again. When you negotiate with Cuba, you are negotiating with the government, a very corrupt government. You will see some tourism as there is limited risk in landing a plane or docking a ship and letting the passengers spend the day. However, they do not have the infrastructure to scale tourism in any form. There are not that many vintage 1950 automobiles or homes in good condition for an AirBNB. We, the US, are being played like fools in this latest round of diplomatic propaganda. Cuba has even convinced us that we are the bad guys and are asking (demanding) restitution. I caution about the illusion being sold to us as the most innovative of Cuba’s industries is the propaganda machine. Since your newsletter is focused on financial advice; I thought of providing an economic perspective and not delve into human rights or politics.